We have three new models of stainless steel fenders. I generally prefer alloy fenders for road bikes, but there are good reasons to choose stainless steel. 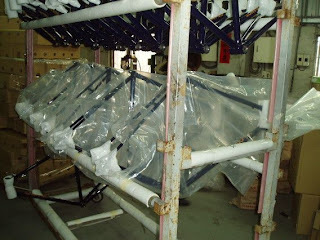 Stainless steel fenders are more durable and dent resistant. They are particularly good for city bikes that spend time in bike racks and locked to parking meters. 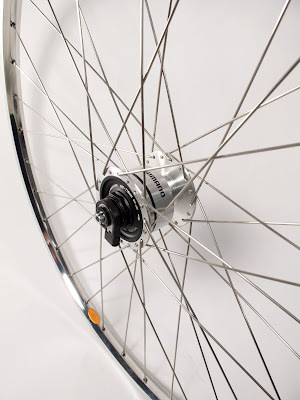 Stainless steel fenders should also be considered for long distance touring bikes where maximum reliability is more important than a little extra weigh. The first new model is a 60mm 26" fender set for city and touring bikes that take a lot of abuse and run wide tires. 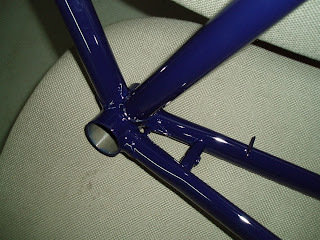 Next, we have a 58mm 650b fender. It will accept tires up to 48mm wide. Not that many folks need tires that wide, but if you think you do... It's also good for 38mm to 44mm tires when you ride on littered roads or trails as it provides extra room around the tire decreasing the chances of twigs and pebbles getting caught between tire and fender. Finally we have a 47mm 700c fender. This is a special deal fender that's only $35 while they last. Why? These fenders are 18mm deep, versus 22mm for our other VO fenders, so the tire coverage is not as good. 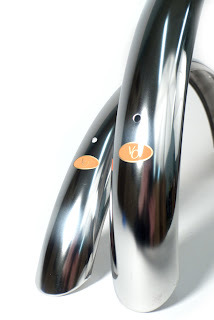 Otherwise they are identical to our other stainless fenders and come with the same hardware. We also have our older model 45mm 700c stainless steel fenders that have proven very popular since we introduced them last spring. These new fenders, and all other VO models, are pre-drilled and come with the hardware kit. 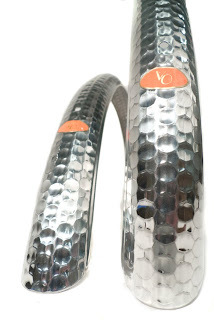 VO 45mm hammered fenders are here and they are really hard to photograph, too darn shiny. The pattern is interesting, large octagons surrounded by small pentagons. $50 with all hardware. We also have three new models of stainless steel fenders which I'll write about in a couple of days. Many many customers have asked us to make a French thread headset. Well, they just arrived and the first one was installed on my very own Motobecane. They are an alloy ball bearing headset finished in polished silver. The stack height is 41mm and weight is 113g. We even had tooling made to produce the proper French-style washers with the flat on the inside. Interestingly, that washer was more trouble to get made than the rest of the headset. 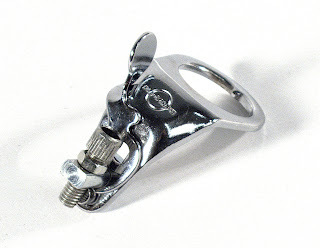 In keeping with the retro-theme, we now have the classic Dia Compe front cable stops with quick release. 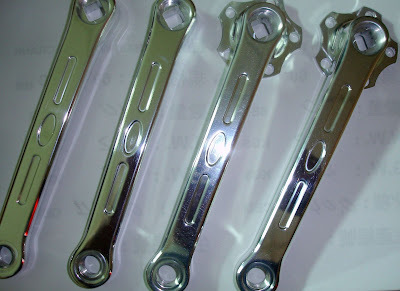 They are chrome plated, just like the old ones and not as light as a modern alloy stop, but that quick release sure is handy. 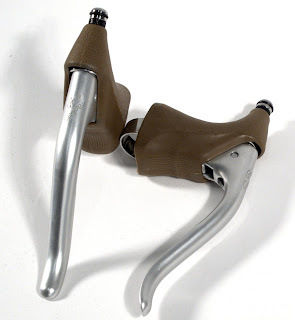 Dia Compe has also re-introduced their lovely non-aero Gran Compe brake levers. You may remember that "Gran Compe" was the designation for their top of the line components, like VO's Grand Cru or Shimano's Dura Ace. The levers have a smooth silver anodized finish and check out the neat adjusters with O--rings. Finally we have the VO brake pads in a new color, brick red. The compound is the same as the original and it still doesn't squeal. It also brakes as well as any pads we've used, especially in wet conditions. We changed the color only to differentiate them from the many black pads out there. This will be a running change, as we run out of black the red will become available. The effort to raise money for Haiti was fairly successful. VO sent off a check for over $2000 to Doctors Without Borders. Thanks for your help. 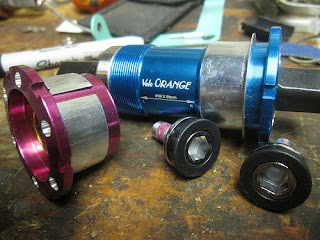 In case you hadn't noticed, prices for Japanese components and accessories are shooting up. This is due to the rising value of the Yen, or the falling dollar. As we, and other importers, deplete our existing stocks and re-order you'll see higher prices on Nitto, Honjo, MKS, and Sugino products. 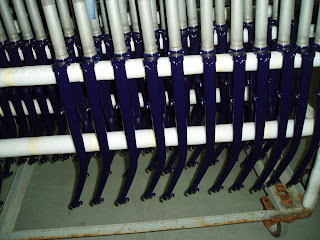 So it's a good time to be developing more products in Taiwan, like the bars and stems below. 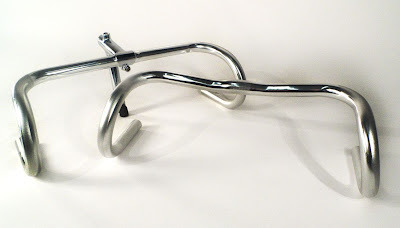 The prototypes for these two new drop bars look great. One is a medium reach bar loosely based on the Phillippe Professional, but with a longer flat behind the hoods and slightly longer drop. The second is our own design for a randonneur bar that's based on the best traits of several French and Japanese randonneur bars I've owned. We also have the new quill stem design that should go into production in a couple of months. 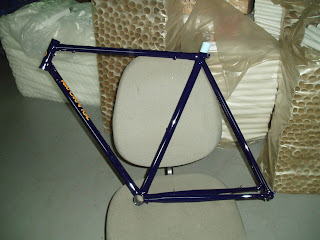 It's fillet brazed and chrome plated. 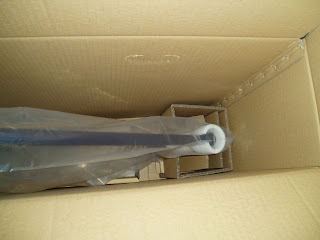 The one in the photo has too long an extension in back, but is otherwise the right shape. 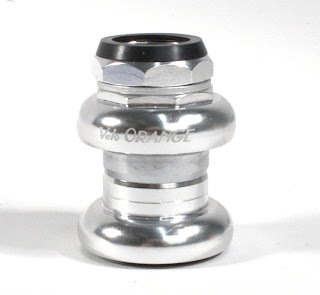 A 1-1/8" threadless fillet brazed stem will also be made. You may remember that we were developing a stem and we went through a couple of designs before settling on this one, but if it sells well we'll do another model like this one. We've made a minor modification to the VO Course and VO Moderniste bottle cages. 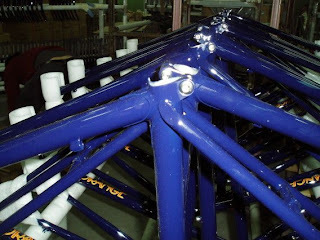 The tangs on the mounting plate are longer to allow use with bottle cage clamps for bikes that lack cage bosses, or to add a third cage. Chris -- we'd like to partner and we'd step up with 10% donation on any Minnehaha gear sold through VO Imports and through the VO direct to consumer store. So a total of 20% of any sales of Minnehaha bags will go to Doctors Without Borders. I e-mailed Grant Petersen, president of Rivendell, last night mentioning our little effort to donate to Doctors Without Borders. Grant immediately signed on; he's a really good guy so I had little doubt that he would. Rivendell will also donate 10% of sales for today and tomorrow. Grant also wrote a very good post in his Peeking Through the Knothole blog about the effort, well worth reading. He takes on the tricky topic of altruistic versus business motives. BTW, if you're not familiar with the Pat Robertson incident Grant mentions, it's covered here. So if you've been meaning to order from either company, now is a good time. If you don't need anything please donate directly. Perhaps we might persuade other bike companies to follow suit. If you have any contacts please e-mail and ask them to join us. Velo Orange and VO Imports will donate 10% of our gross sales over the next 48 hours to the Doctors Without Borders (Médecins Sans Frontière) Hatian relief effort. As you must know, Haiti is by far the poorest country in the Western Hemisphere and they just suffered a devastating earthquake. Hospitals, schools, parliament, and many government buildings, as well as thousands of homes, have been utterly destroyed. Death tolls can only be estimated, but figures of 50,000 to 100,000 have been reported in the media. Doctors Without Borders/Médecins Sans Frontières (MSF) is an international medical humanitarian organization working in more than 60 countries to assist people whose survival is threatened by violence, neglect, or catastrophe. They already have teams on the ground in Haiti. Soon Haiti will need massive help in rebuilding the country, but for now the priority is to treat the hundreds of thousands who are injured or dying, which is why we chose to donate to MSF. So if you were planning to place a VO/VOI order there may never be a better time. We know it's not much, but if other companies kick in it may make a real difference. Or better yet, donate directly to MSF, International Committee of the Red Cross, Oxfam International, or other relief agencies. The VO Rando frames are finished and packed. Now we're just waiting to get them loaded onto a ship. If there are no delays in customs they should be at our shop in a few weeks. 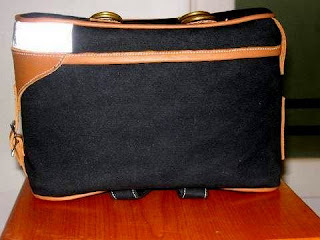 Here are a few photos of the prototypes for two new bag models. The bag above is our new large British style saddlebag with an expandable main compartment. 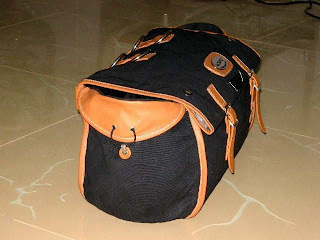 Capacity is around 20 liters, so this is a large sized bag. This is our new Eclair bag. 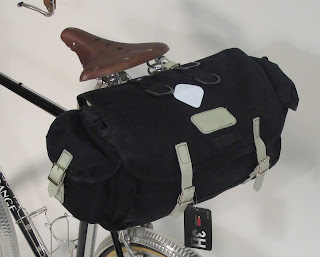 It's a small rack top bag sized to fit on our Constructeur rear rack. The production version will be a little lower. The VO panniers need more work, so no photos yet. It'll be a long slow job to get the panniers exactly right. 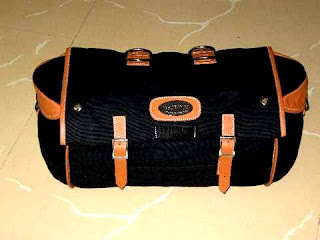 Please don't ask when any of the new VO bags will be available; it all depends on how many changes we make after testing. 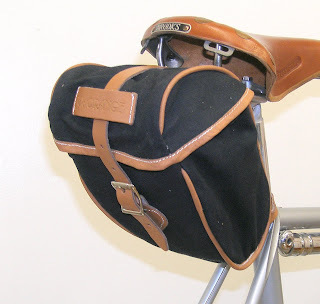 We also have a new large saddle bag from Origin-8. At $60 this is a pretty great deal. It's 13.5" x 7.5" x 8.25" and uses a wooden dowel for support. The fabric is thick polyester canvas. Finally, a new shipment of our ever popular VO Croissant bags just arrived. They will be back in stock soon. This new production run has nicer leather with a softer finish. Tarik's blog, Moscaline, is full of strange and interesting stuff. He just wrote a very comprehensive review of the new VO Threadless BB. And he tried the BB out in no less than five frames, including some odd Raleighs. There are also some detailed installation instructions. 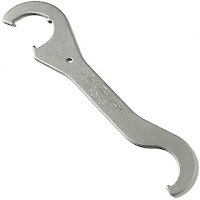 I did want to clarify the part about the best tool to use, a simple old fashioned BB wrench as shown below. A pin wrench also works. There is no need to get it super tight.